The Manawatu 50m Outdoor club shoot at the Rifle Rod and Gun Club range, Turitea. The 50 metre prone and 3P (3 position, standing, kneeling and prone) events are shot outdoors with .22 calibre smallbore rifles. These rifles are exactly the same as are used indoors at 25 yards. The use of telescopic sights is prohibited and only aperture sights are allowed. These 3P and prone events are made more difficult as the wind speed and direction constantly challenge the shooter. The 50m outdoor target is 112 mm diameter, with the 10 ring only 10.4 mm across. This means the rifle muzzle only has to move 0.14mm at the muzzle to move the point of impact from the centre to the edge of the 10 ring. Also the wind can move the bullet yet another 10 -20 mm sideways. 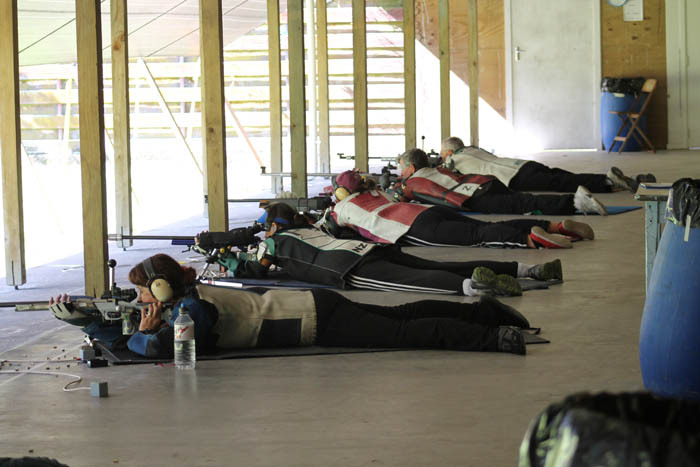 All this makes for a very challenging event as the top shooters strive to reach the perfect 600 score from their allocated 60 shots in the prone event or 1200 from 3 x 40 shots (3P event). The key to shooting well outdoors is to be patient and wait for the same conditions as previous shots. Complicating this waiting game is the time limit of 75 minutes (prone) making for strategy decisions mid-match as conditions change and may force the shooter to change to another wind condition which then requires an estimate of the windage and elevation changes as a return to sighters isn’t allowed once the match is started. The outdoor season runs from September to March. Many of the indoor shooters will also participate in outdoor over the summer.